Jeffrey Inscho: Jeffrey is a cultural hacktivist and raconteur based in Pittsburgh, Pennsylvania, USA. His work plays thoughtfully at the intersection of digital culture, mindfulness, strategic subversion and DIY. Beck Tench: Beck is a designer, technologist, and PhD student at the University Washington in Seattle. The questions that fuel her work are mostly about using (and not using) technology to create space for intention in our personal and work lives. In November 2013, Jeffrey and Beck were part of an MCN conference session entitled Communication Breakdown. Discussion during the session focussed on the pervasiveness of technology and ways we can become more intentional with our use of digital media and devices. Since then, Jeffrey and Beck have continued to think about this and related topics, and have entered into an analog exchange of ideas around these concepts. 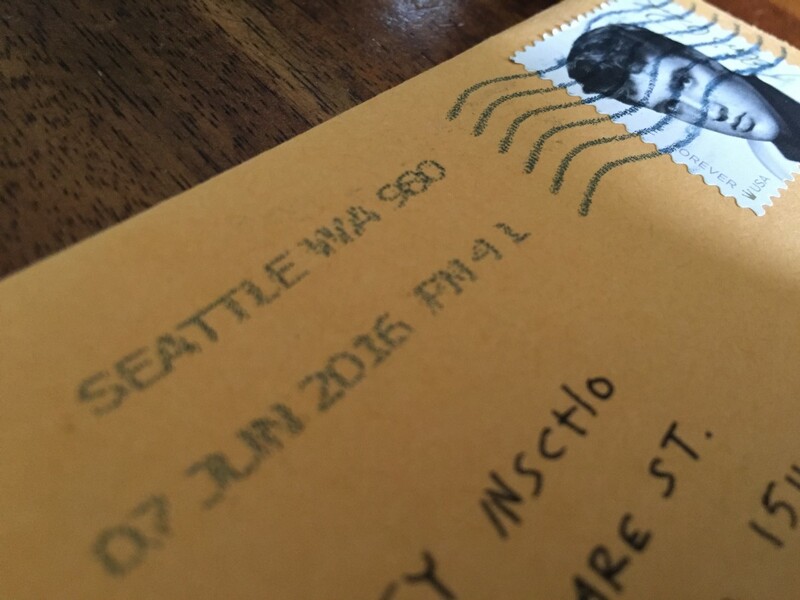 Over the summer of 2016, they corresponded via hand-written letters and snail mail. The result of this correspondence is digitized here. A letter from Jeffrey to Beck. View an OCR’d PDF. All apologies for the delay in writing. Things have been very busy at work and home, and I’ve been trying very hard not to overcommit. You might say I’ve been trying to remain mindful and intentional in all areas of my life! How’s that for a segue? When I first heard about the second season of CODE|WORDS, one that pairs museum innovators for an extended and provocative back-and-forth exchange, I immediately thought about the great discussion we had at MCN2013 in Montreal about pervasive technology and its far-reaching tentacles into our modern, connected lives. This is an area I continue to think deeply about (and struggle with) and I know you do too. In an attempt to begin this exchange with a museum focus, do you think our institutions should be mindful of digital life-creep? In a world where we stumble over ourselves to be the first with the shiny new thing, how can we respect balance and promote intentionality within our organizations when we have such a difficult time doing it for ourselves? 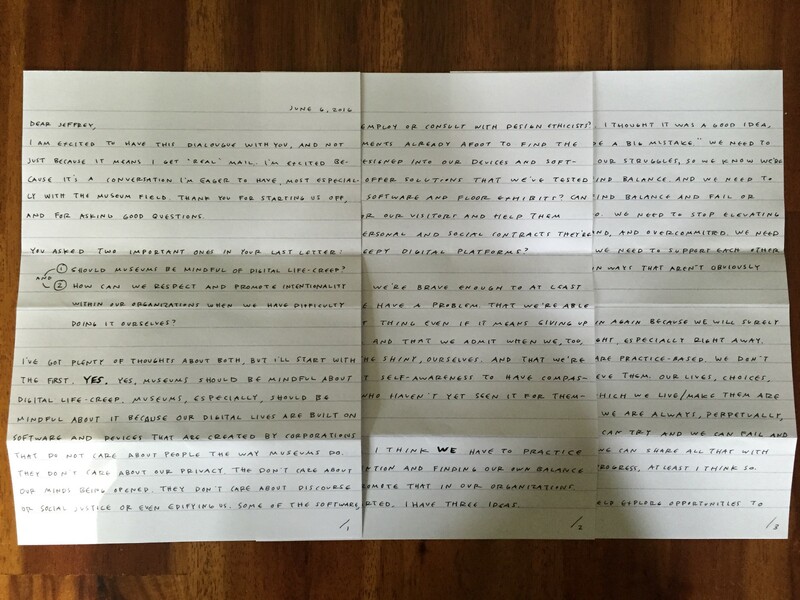 A letter from Beck to Jeffrey. View an OCR’d PDF. I am excited to have this dialogue with you, and not just because it means I get “real” mail. I’m excited because it’s a conversation I’m eager to have, most especially with the museum field. Thank you for starting us off, and for asking good questions. Should museums be mindful of digital life-creep? How can we respect and promote intentionality within our organizations when we have difficulty doing it ourselves? I’ve got plenty of thoughts about both, but I’ll start with the first. YES. Yes, museums should be mindful about digital life-creep. Museums, especially, should be mindful about it because our digital lives are built on software and devices that are created by corporations that do not care about people the way museums do. They don’t care about our privacy. They don’t care about our minds being opened. They don’t care about discourse or social justice or even edifying us. Some of the software, on some of the devices, some of the time may support moments of social movement, exposure to new ideas and various kindnesses, but those moments are rare and are not what fuel the decision-making behind the boards that govern the leaders that manage the developers that support the designers of platforms museums frequently use to build and market our digital engagement efforts. Furthermore, many of us have missions that are in misalignment with the values that inform the design of those very platforms. Libraries end up using ebook software that has no regard for privacy. Science museums use social media that distracts more than it enables observation of the natural world. Art museums invest infrastructure that only the most privileged have access and ability to use. We assume that if our participants say it’s okay then it’s okay, but I don’t think we have the ethics of all this figured out yet — not from an individual, institutional, or regulatory point-of-view. Should museums employ or consult with design ethicists? Can we join movements already afoot to find the anti-patterns designed into our devices and software? Can we offer solutions that we’ve tested with our own software and floor exhibits? Can we advocate for our visitors and help them negotiate the personal and social contracts they’re making with creepy digital platforms? I hope so. I hope we’re brave enough to at least acknowledge we have a problem. That we’re able to do the right thing even if it means giving up some attention. And that we admit when we, too, are lured by the shiny, ourselves. And that we’re able to use that self-awareness to have compassion for those who haven’t yet seen it for themselves. Second Question: I think we have to practice living with intention and finding our own balance before we can promote that in our organizations. And to get us started, I have three ideas. First, I think we start small. As you know, I’m a believer in small things adding up over time. Small things are more achievable and fail-able than big, cold-turkey type changes. The science seems to be on that side, too. What’s it look like to check social media only once a day for a week? 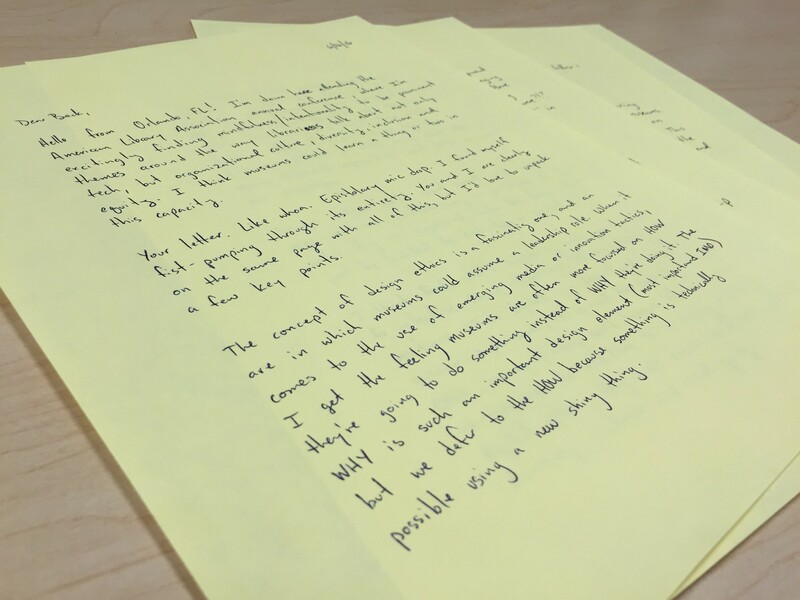 Or start our day with reflective writing after we make our first cup of coffee? Or switch our regular Thursday afternoon meeting to a nature walk? These small changes can turn into habits that give balance to a work life that’s not particularly spacious or supportive of reflection. I had a mother hen troubled with fleas, so I ruffled her feathers up and dusted her with flea powder. Then the chicks all went under her and they died. Dust baths are much better for controlling fleas. She just put it out there — “Hey! Don’t do this thing I did. I thought it was a good idea, but it wasn’t and I made a big mistake.” We need to share our failures and our struggles, so we know we’re not alone in trying to find balance. And we need to share when we try to find balance and fail or struggle with that too. We need to stop elevating being busy, and in demand, and overcommitted. We need to celebrate saying no. we need to support each other in spending work time in ways that aren’t obviously productive, or generative. And third, we need to begin again because we will surely not get any of this right, especially right away. Balance and intention are practice-based. We don’t ever permanently achieve them. Our lives, choices, and the contexts in which we live/make them are far too dynamic. But, we are always, perpetually able to begin again. We can try and we can fail and we can try again and we can share all that with each other to great progress. At least I think so. I would love to see our field explore opportunities to enrich our balanced, self-aware, intentional life practices. For our conferences to be retreat-style instead of show-and-tell. To feel like my struggles were safe in the ears and eyes of my colleagues and acquaintances. It’s not that I don’t ever feel that way, but as a field, I sense we could do more. Do you have any ideas about what that’d look like for you? Again…it was great to hear from you, Jeff. And also to have the chance/excuse to think deeper than I had been about these things. I look forward to reading your reactions and to see how you build off these ideas. Hello from Orlando, FL! I’m down here attending the American Library Association annual conference, where I’m excitingly finding mindfulness/intentionality to be prominent themes around the way librarians talk about not only tech, but organizational culture, diversity, inclusion and equity. I think museums could learn a thing or two from libraries in this capacity. Your letter. Like whoa. Epistolary mic drop. As I read it, I found myself fist-pumping through its entirety. You and I are clearly on the same page with all of this, but I’d love to unpack a few key points. The concept of design ethics is a fascinating one, and an area in which museums could assume a leadership role. When it comes to the use of emerging media or innovation tactics, I get the feeling museums are often more focussed on HOW they’re going to do something instead of WHY they’re doing it. The WHY is such an important design element (most important, IMO), but we defer to the HOW because something is technically possible using a new shiny thing. Do you know of any museums that employ a design ethicist? I don’t. If there are ethical design or development decisions to be made, they likely fall to the person managing the project or responsible for departmental oversight. More often than not, I’d project those decisions are not coming from a place of expertise or nuance. But what if they were?!? 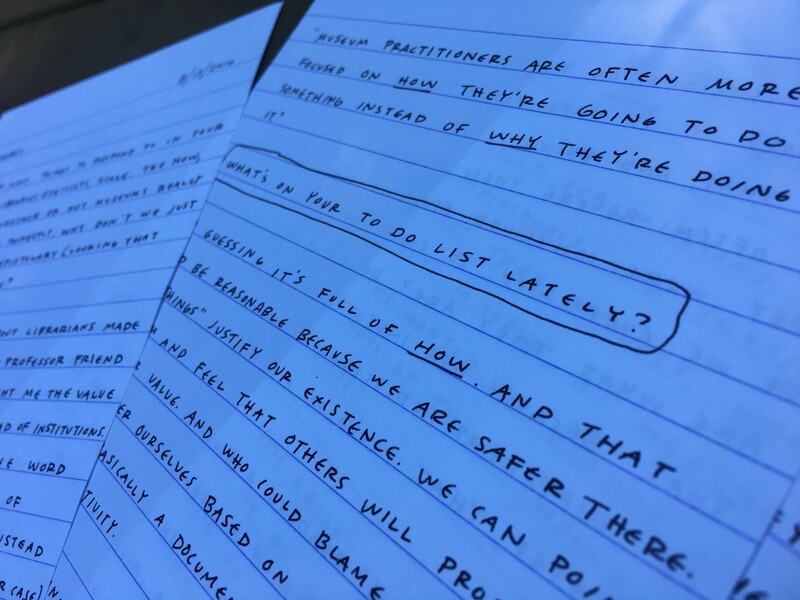 A design ethicist on staff could ask the question “Why?” in many different capacities and hold us accountable for our responses. Design ethics could start small and scale throughout our organizations, influencing a multitude of design decisions until it’s engrained into the fabric. And not just limited to technology or digital silos. I think that’s what’s happening with many museums starting to introduce Chief eXperience Officers (CXO) in senior leadership positions. While digital is a large (and larger) component to the museum experience, it is not the entirety of that experience. CXOs, in my opinion, could become de facto experience ethicists for museums. In addition to overseeing mindfulness in the digital sphere, they could ensure mindfulness with respect to diversity, inclusion and social equity. I may get myself in hot water here, but I think caring about people is a relatively new concept for museums. Historically, museums have placed a great deal of emphasis on their collections and scholarship, less so on the people. This is evident on the front-end with perceived elitism and myriad barriers to entry. It’s also evident on the back-end with rampant staff churn, unpaid internships, etc. I think museums have the potential to care about people more than corporations, and we’re beginning to see that promise manifested with programs and initiatives like The Incluseum, the empathetic museum movement, #MuseumsRespondToFerguson and the creation of CXO positions tasked with crafting intentionally designed experiences for people. For me, when I think about mindfulness and intention with respect to digital technologies, the Achilles Heel is this concept of scale. Scale can be a trap, especially when museums work best on the individual or small group/community level. Have you by chance read Jesse Kriss’ Human Scale Technology? It’s a fascinating read about how we ended up here, in this infinite galaxy of scale. It also puts forward some ideas about how we might begin to bring the edges of that galaxy inward — to maybe fishbowl-size — so we can start designing thoughtful, impactful and intentional experiences for the people that mean so much to us. 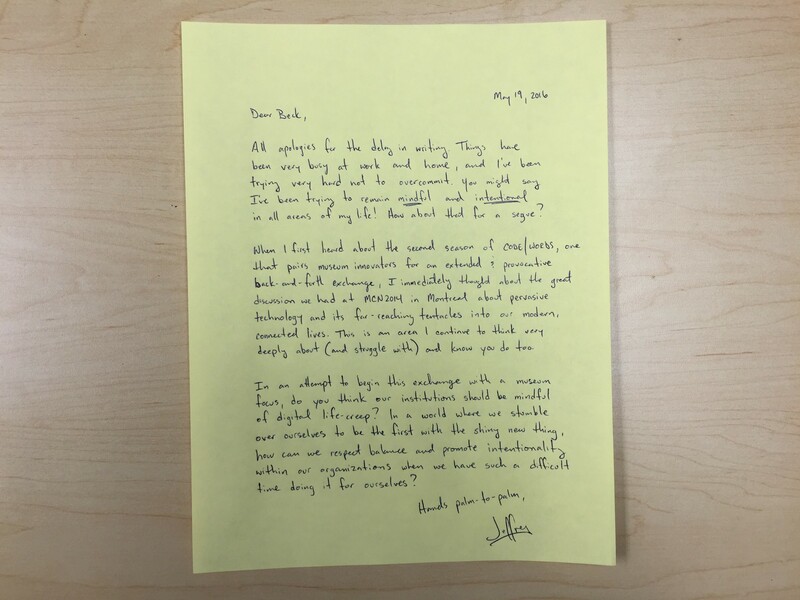 There are so many things to respond to in your last letter: Libraries, Ethicists, Scale. The how, the why, and whether or not museums really care about people. 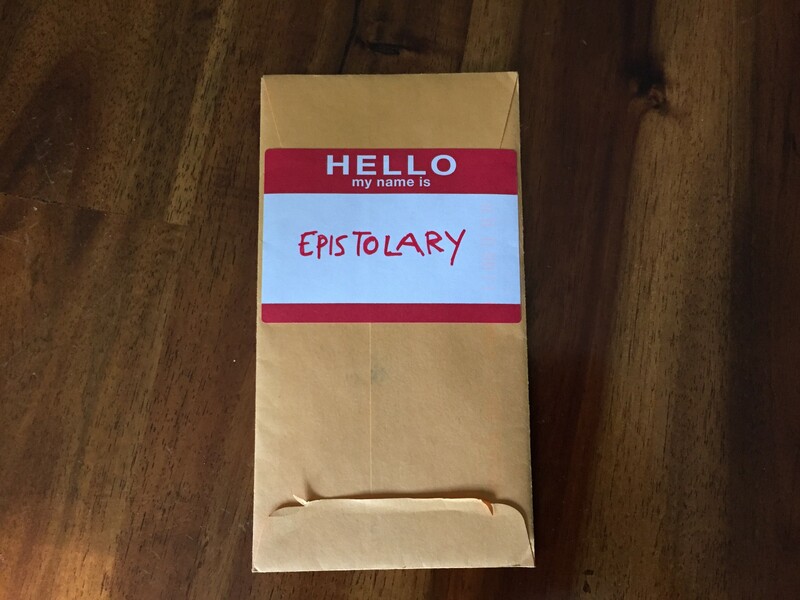 Honestly, why don’t we just spend every day in epistolary (looking that word up again) pursuits? Reading your comments about librarians made me think of a librarian and professor friend of mine, David Lankes. He taught me the values of focussing on individuals instead of institutions. 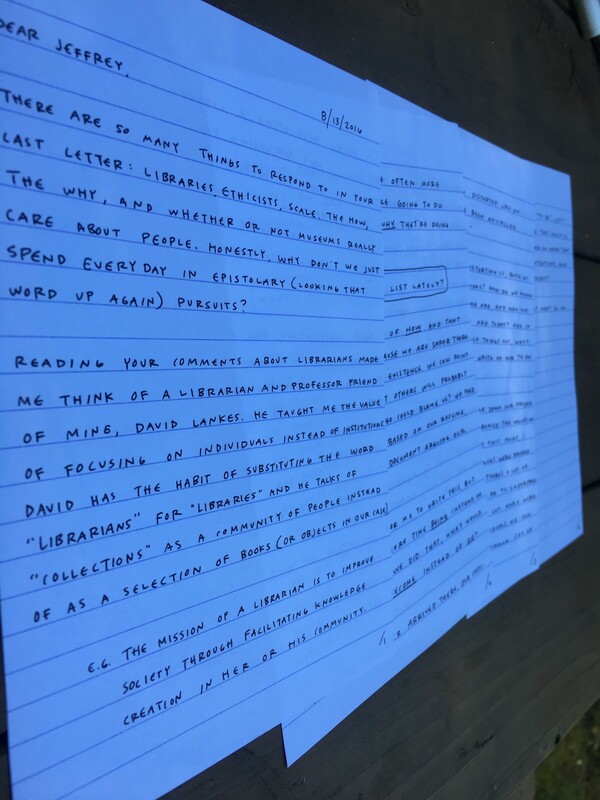 David has the habit of substituting the word “librarians” for “libraries” and he talks of “collections” as a community of people instead of a selection of books (or objects in our case). e.g. The mission of a librarian is to improve society through facilitating knowledge creation in her or his community. or e.g. Developing a library’s collection isn’t purchasing technology or curating books or developing maker spaces, it’s edifying and empowering individuals in a community through whatever means (books, devices, spaces) those individuals need. What happens when we restate this sentence as David might? Whats on your to-do list lately? I’m guessing it’s full of HOW. And that would be reasonable because we are safer there. “How Things” justify our existence. We can point to them and feel that others will probably get their value. And who could blame us? We feed and shelter ourselves based on our resume, which is basically a document arguing our life’s productivity. How silly it sounds for me to write this, but what if we spent more time being instead of doing at work? If we did that, what would our institutions become instead of do? Long before we ever arrived there, our institutions decided on their purpose — their mission — and most of us have found a way to identify with that and bring it to life in our own work. We often revere these statements and assume they were conceived from insight and inspiration. Do we ever stop to consider why our missions are what they are? Do we ever stop to think that because our institution is now comprised of different individuals than when it was created, that mission might change? Could our missions be distorting us, both as individuals and institutions? How do we know that they reflect who we are, and who we exist to serve, as we/they are today? And if we wanted to figure these things out, what sorts of things would we write on our to-do lists? Jesse Kriss tells us to scale down our projects so we do not have to compromise the values we have in making them. But at this point, I wonder how much those values were handed down to us to begin with. There’s a lot of individual work we need to do to understand what our values are. And a lot more work to understand how, as individuals, we can work together under a common set of values. We might be in hot water together (you for saying museums don’t necessarily care about people and me for saying this…), but what if our institutions matter a lot less than the individuals that are in relationship because of them? And what if the work of those individuals (leadership, thinkers, doers, visitors) focussed more on the gradual discovery of their complicated and completely dynamic lives than the preconceived missions we spend our time in pursuit of? Could we stand to keep a “to-be” list? What would be on it? Would that help us be more ethical? More focussed on work that aligns with our strengths, intentions and the needs of our community today? Or would we all get canned? What do you think? Opening up my mailbox to find a new letter from you has been a highlight of my summer. I find myself eagerly anticipating your poetic words and unique insights. Your (and David’s) recommendation of focussing on individuals is a great one. In the museum world we often consider our institutions before ourselves, but I wonder how much of this consideration of the self is rooted in an established, identified community of professionalism? For example, librarians (generally) self-identify as librarians. And I think this self-identification extends outward to professional roles working in other areas of a library, more so than it does in the museum context. There seems to be a more organized community of professionalism in the library sector. How do museum workers self-identify? I know when someone asks me what I do for a living, the technologist bit comes first and the museum bit usually comes later. I’ll bet we’d get similar stories from educators, marketers, administrative staff and human resources professionals working in museums. Curators would likely be the outlier here, because their training and roles (for the most part) are specific to the museum field. Imagine, though, if we could all rally and coalesce around a unifying professional self. This professional self should transcend departments and job descriptions, and unite/motivate all of us in the field under a common ethos, much like librarian does in the library sector. Museum professional doesn’t cut it. It needs more meat on its bones and more life in its label. Maybe something like museumist, or better yet, museopunk (see what i did there?). I don’t know…just riffing here…but I think some good could come from growing an organic sense of community among a broad swath of our colleagues. Talk about the potential for true bottom-up change. And your questions about mission are, in my mind, directly related to empathetic leadership approaches. Progressive, responsive adaptations to missions rely on directors, boards and trustees being open enough to realize that what they currently have isn’t working. That’s certainly an interesting juxtaposition to bottom-up change catalyzed by the formation of a collective professional self. The ultimate goal for all of this would be for those directors, boards and trustees to identify in solidarity with the new emerging professional self for the sector, and make the leadership decisions required to support/strengthen the collective self. Real change happens when bottom-up momentum meets progressive top-down leadership. Real change is a perfect storm of upward and downward trajectories that meet with force in the heart of an organization. Real change is made through hard work and heavy lifting by individuals at all levels of an organization. That’s why it’s so hard. But what we’re talking about here could lead to that real change. Only then might we focus on things like to-be lists, asking why before how, and gradual discovery without the threat of getting canned! In an attempt to sum up our epistolary romance over the last few months, I find we’re left with many more questions than answers. And that’s okay. I always find inspiring questions to be more impactful than pragmatic answers. Hopefully our dialog is not taken as the definitive end to this discussion, but rather a collective beginner’s mind for all in the field who are considering mindfulness within their professional practice. Beck, it was so great to have this opportunity to explore these topics with you. 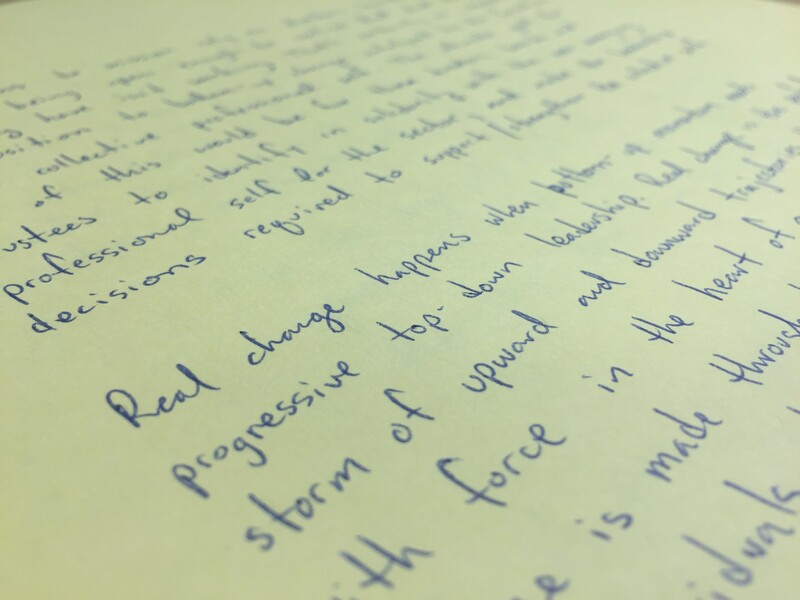 Through these letters I am seeing my work in new ways, and that’s invigorating. Please be well and don’t be surprised to receive a note from me here and there every now and again.